Transit would be better served if the pay-per-ride and unlimited fare schemes that currently dominate were expanded to include more fine-tuned pricing structures similar to those offered by cell phone companies. Winner Adam Davidson, a Ph.D. student and Mobility Lab contributor, imagined transit fare plans that, similar to mobile phone carriers, might include “free nights and weekends” (that is, free off-peak rides). He was persuasive in arguing that such a scheme would suit different user needs better than the current system, incentivize transit use, and increase customer satisfaction. Davidson demonstrated how a “transit virtual network operator” could buy fares in bulk and re-sell them to customers similar to the manner in which Boost Mobile re-brands and sells minutes on Sprint’s mobile network. Davidson said, “We have the technology, we just need enabling legislation.” His plan also allows for the potential of inter-jurisdictional fare plans, which would certainly be welcomed by many transit riders. A blue ribbon panel of judges (venture capitalist Hooks Johnston of Valhalla Partners, former Virginia Secretary of Transportation John Milliken, Esq., and Vice President of Policy for American Public Transportation Association Art Guzzetti) narrowed the panelists down to three, who presented their transportation policy innovations. Kaing’s entry started with an implementation of Bus Rapid Transit (BRT), replete with dedicated right-of-way. Next, Kaing opened up the dedicated BRT lanes to permit the use of taxis and transportation network companies (TNCs) such as Uber and Lyft to utilize the dedicated lanes. Congestion pricing for TNCs plus taxi credits for bus riders could be utilized to control the quantities of each service on the roads. Kaing predicted that his plan would result in a decline in single-occupancy vehicle use and car ownership. In addition to the three contest finalists, the event also featured keynote speaker Gil Penalosa, who discussed his experience in transforming automobile-centric places into pedestrian-oriented, vibrant communities. Penalosa, former commissioner of Bogotá, Colombia, called his mission one of “dignifying the pedestrian.” Penalosa is currently executive director of 8-80 Cities, which claims that cities designed for 8-year-olds and 80-year-olds work for everyone. 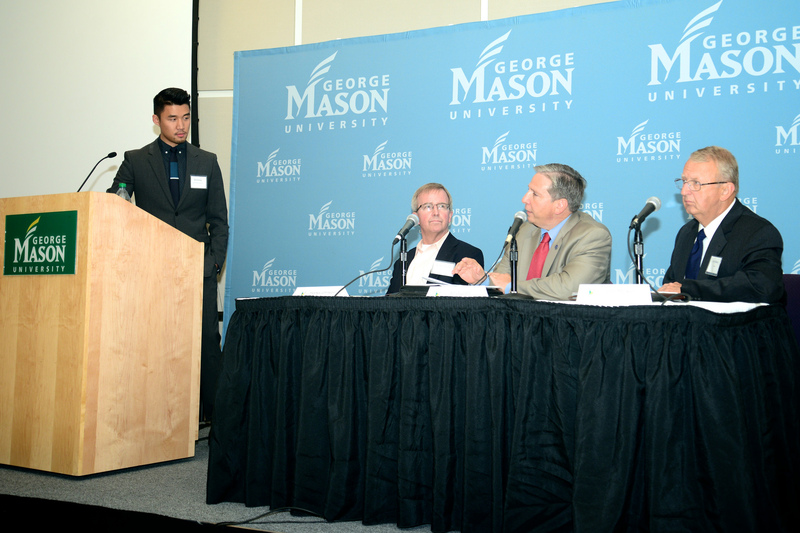 Penalosa said that we need to “stop building cities as though everyone was 30 and athletic.” Graduate students in GMU’s Transportation Policy, Operations and Logistics (TPOL) program have recommended adoption of the 8-80 Cities concept in Arlington County, Virginia. Photo of Earl Kaing by M.V. Jantzen. Ride Public Transportation, Find Love?